Our finishing salt makes a great gift. 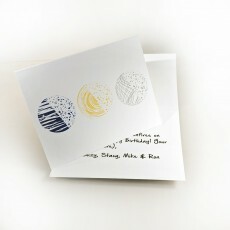 Make the present even better by adding a card personalized with your message. You compose the message and we pen it for FREE. Or maybe you just think this is a neat notecard and you want a blank card to write out yourself. To order a notecard, add this item to your cart. For us to personalize it, be sure to include your message in the box above. Please note that all orders include a packing slip that does not show any prices, but does include the customer's name, the delivery name and address, the products ordered (including this card, if selected, and text of your message), and any comments noted on the checkout page.